The Oak Island Pier has a legendary reputation as one of the best places to reel in a king mackerel, and its recent history speaks for itself. With over 250 kings being reeled in from the pier on an annual basis, the structure has become an oasis for fishermen from all along the East Coast who want to drop lines and hopefully bring home an Oak Island souvenir that will double as an once-in-a-lifetime fishing story. 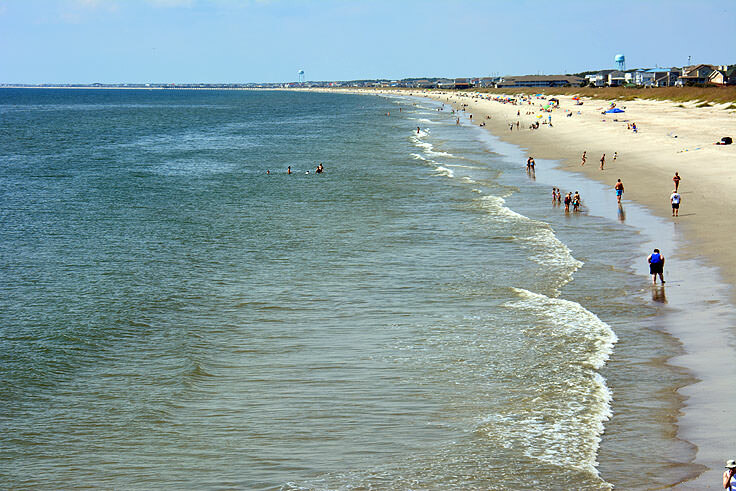 Of course the pier is also an incredible attraction for everyday vacationers and sightseers as well, and features incredible vistas of the Atlantic Ocean and the surrounding Yaupon Beach community. 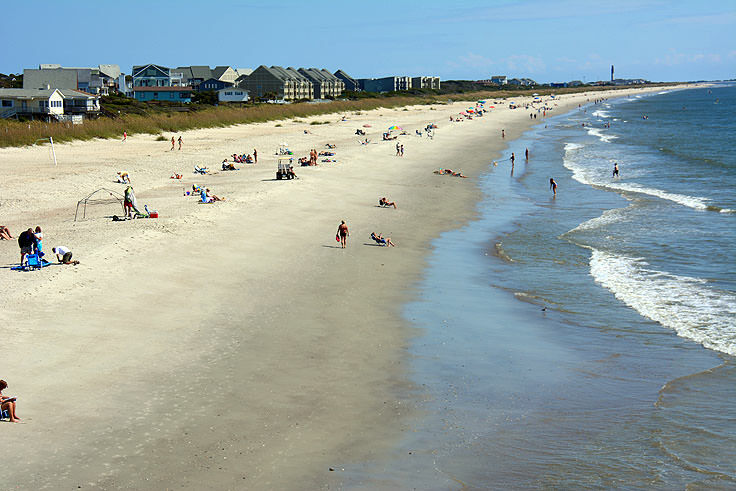 With an on-site restaurant, and fantastic seasonal events that range from music on the beach to renowned fishing tournaments, the Oak Island Pier is essentially the place to be on any given day at the beach. The pier was originally built in 1955 and was known as the "Yaupon Pier," a nod to Yaupon Beach, the original town in this region of Oak Island, and the current community where it resides. Though it weathered a number of hard hitting hurricanes, including Floyd in 1999 and Irene in 2011, the pier had to be rebuilt twice during its lifespan: once in 1972 and again in 1992. The current structure is a straight 908' foot long wooden series of planks that extends into the Atlantic Ocean, and at 27' feet above sea level, is currently the highest pier in North Carolina. Always a popular destination for fishermen, seasoned anglers have been reeling in catches from this mid-Atlantic location for generations, and the catches depend on the season, weather, and the fishermen's luck. Popular catches include pompano, tarpon, sheepshead, bluefish, Spanish, and trout, and the pier boasts a number of record-holding catches, including a 1,150 lb. Tiger Shark caught in 1966 that is still the state's largest tiger shark catch. 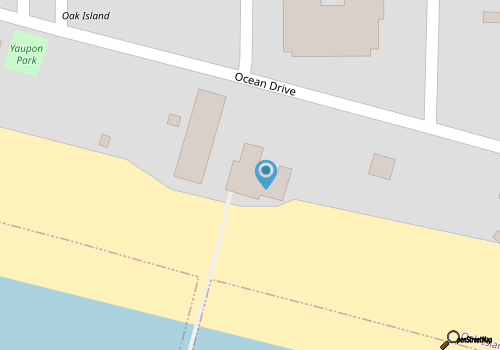 That being said, the pier is best known for its King Mackerel catches, and the Oak Island Pier, in conjunction with its neighbor, the Ocean Crest Pier, hosts a number of seasonal tournaments that target the especially popular species, as well as a number of other desirable catches. Sightseers are always welcome to explore the length of the pier for incredible views of the Atlantic Ocean - both panoramically in the distance, and nearly 30' feet below. 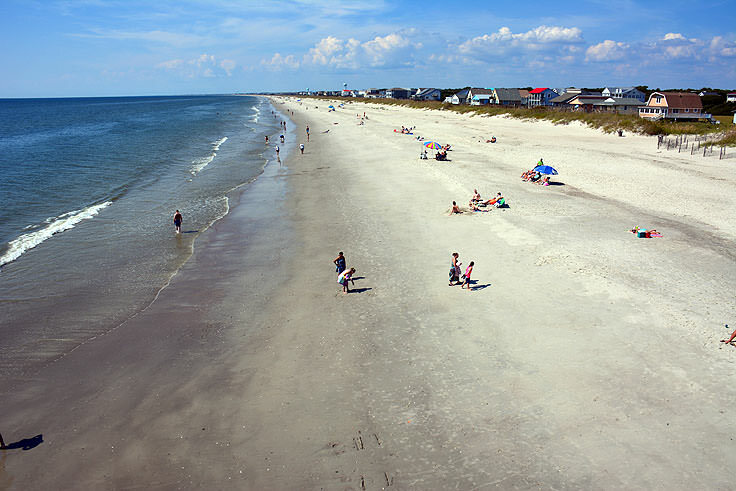 A slightly intimidating experience that's not suited for visitors with a fear of heights, the stroll will give Oak Island vacationers some great photo opts, and an opportunity to see the beach from an entirely new view. 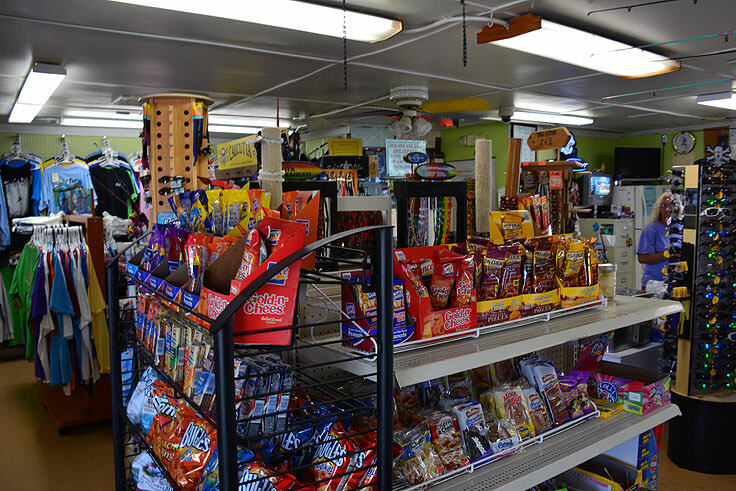 The pier also features an expansive Pier House, which has fishing equipment, both for sale and rent, snacks and refreshments, live bait, and coastal souvenirs that any angler would love to take home. There's also a restaurant on site, the Flying Fish Cafe, which serves breakfast, lunch and dinner to hungry anglers or anyone in need of a good, satisfying beachside bite. Specializing in casual coastal classics, like hearty burgers and fried fresh catches of the day, the restaurant has arguably become just as big as a local destination as the pier itself. On site, and on the beaches bordering the pier, seasonal visitors will also be treated to a number of non-fishing outdoor activities, including summertime beach volleyball tournaments, outdoor music concerts with local bands, and even Saturday horseshoe tournaments. Pier visitors are advised to check out the scene at the base of the pier pilings, especially on a summer weekend, to see what new local competitions or events are taking place close to shore. 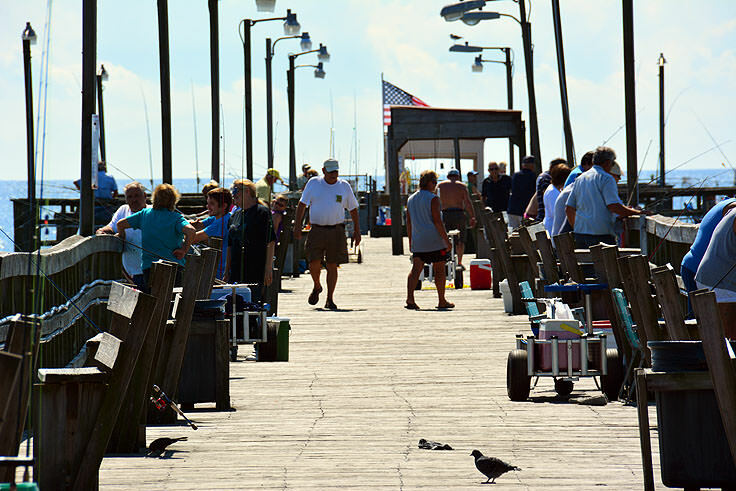 The pier is seasonally open, and closes during the winter months for annual maintenance, however it holds long hours in the spring, summer and fall months that allows ample time for both day and night fishing. The cost of pier passes are based on a multitude of actors, including the type of fishing, (bottom or king fishing), the age of the angler, and the duration. For example, a daily bottom pass for an adult runs around $10 for a 24 hour period, while an annual bottom pass for frequent visitors is $200.00 per year. Visitors can get a complete list of passes available at the pier's website, and many vacation rental homes also offer a complimentary "pier pass" for their guests as well, ensuring that anglers can enjoy a vacation filled with all of the fishing action on the pier, complimentary with their stay. When it comes to exceptional fishing and high-rise views that are unparalleled on Oak Island, you can't beat the Oak Island Pier. 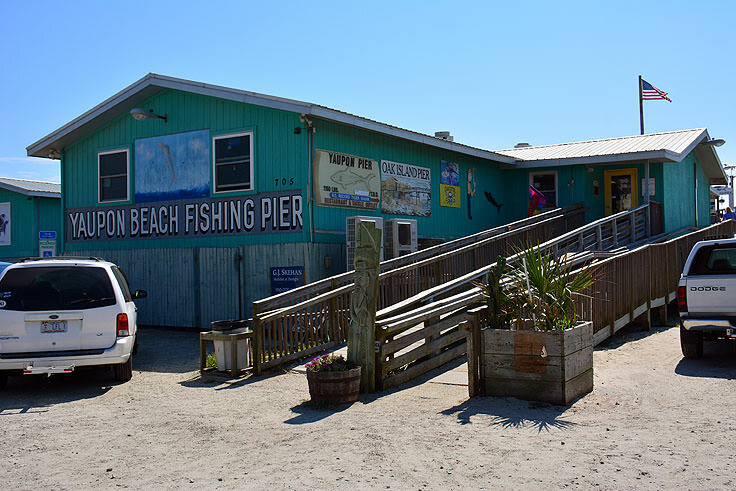 A local staple for decades, this landmark has become a favorite family destination for decades, entertaining all vacationing party members with fun off-the-pier events and sumptuous dining, in addition to Oak Island's world famous fishing conditions. A remarkable sightseeing trip for any visitor, and a must stop destination for angers of all varieties, the Oak Island Pier is an incredible local attraction that easily turns this beach town into a fisherman's paradise.